Find hotel near Kanichukulangara Devi Tem .. This is another beautiful temple of Alleppey that deserves to be included in your itinerary. This holy shrine is dedicated to the Hindu mother goddess Bhagawathi. The best fact about this temple is it has a free and open management. It is free to every religion or socio-economic community. Another fact, that makes this temple special is its location. It is located at the edge of the sea and a has a holy pond adjacent to it. Locals believe that god resides in both inside the temple as well as in the pond. That’s why, during festivals both the deity inside the temple as well as the lake is worshipped. 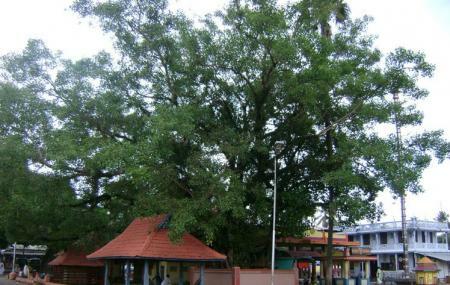 Come during “Thiruvonam” festival to see how it is celebrated in this temple. Follow common Hindu rituals like leaving your shoes outside the temple. Pay respect to the Hindu rituals followed within the temple. Observe absolute silence inside the temple. By hired car or by taxi from the city. How popular is Kanichukulangara Devi Temple? People normally club together Abad Turtle Beach and St. Andrew's Basilica Arthunkal while planning their visit to Kanichukulangara Devi Temple. People also prefer to start their day with Kanichukulangara Devi Temple. Its nice temple with a vast area. This temple is administrated by SNDP. Here the temple festival is famous. And here is an offer called Chikkara, its a famous traditional culture. A powerful deity. The temple was rebuilt recently and the atmosphere is nice. The “chikkara” is a great festival for which people from all over the state come and take part by staying near the temple. The temple is very authentic in nature, deity is very powerful of which all kind of people come here from all around. "chikara kuttikal" which means children are offered to stay around the temple for 21 days. it"s a well known vazhidap. And the people around are very helping . There is a "utsavam" festival once in a year in which the fire work is famous.